What was I thinking? 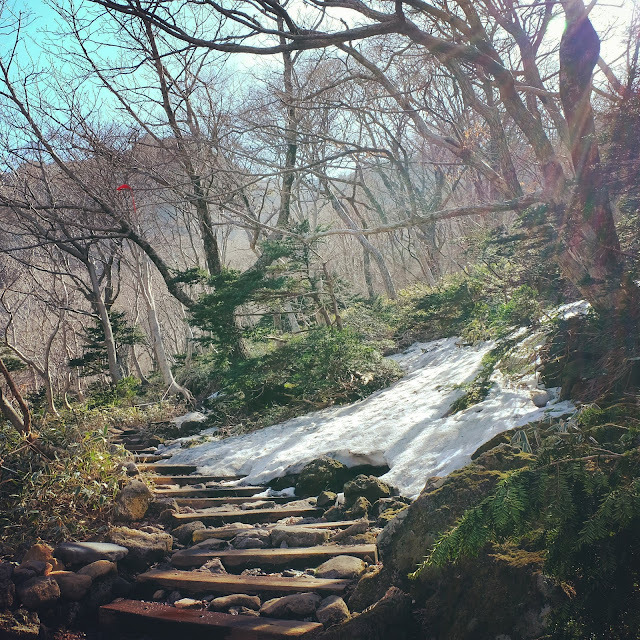 Why did I hike Hallasan (Halla Mountain), the highest mountain in South Korea? I was not thinking, that's what! Hahaha!!! 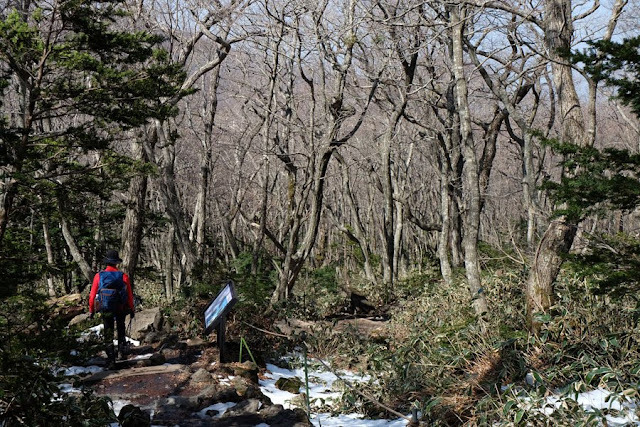 I didn't know it was so (the highest mountain), until after I had hiked it. I woke up early to buy food for breakfast, snacks, and lunch at the nearby convenience store before catching the first bus (bus 240 at 630AM) to Yeongsil Ticket Office of Hallasan. 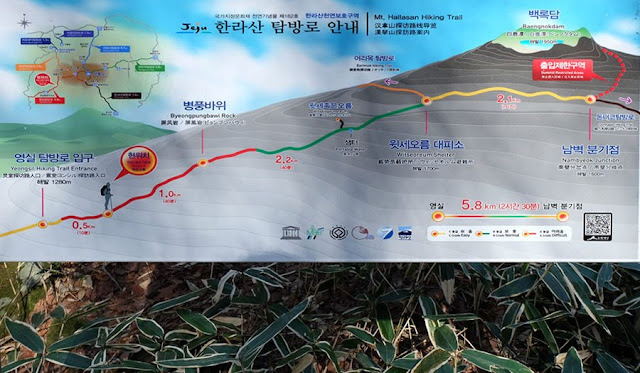 Upon arriving at Yeongsil Ticket Office, I asked for a map then started on my warm up: a 2.5-kilometer uphill walk (on concrete sidewalk) from the Ticket Office to the trailhead. The signs to watch out for snakes and boars every hundred or so meters made me wonder what I would do if I ever encountered one or both of them. I drew a blank. Thankfully, not a snake or a boar stopped for a chat. Nor any car. Many cars zoomed past. One slowed down and looked at me, but did not stop to offer a ride. Maybe he saw I was not Korean and did not know how to offer a ride in English? I would like to think so. Had he offered a ride, I would have gladly accepted it to conserve my energy for the official hike ahead. Reaching the stone engraved with "1280masl," I was officially at the trailhead of Yeongsil. The trail began in a wooded area for a few hundred meters, then the "A Grade [Difficult]" section. 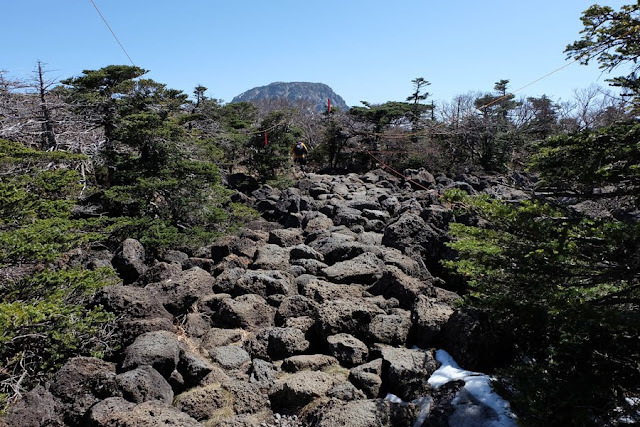 The "difficult" section did not involve ropes or scrambling, nor was it very steep. The section started to incline with flat stone steps that then later on gave way to seemingly endless wooden stairs through open area (without any trees to provide shade). It was indeed a long climb on stairs and, in some sections, on steps made of rock. But the 360-degree view was so beautiful that I always had an excuse to stop and take a breather. 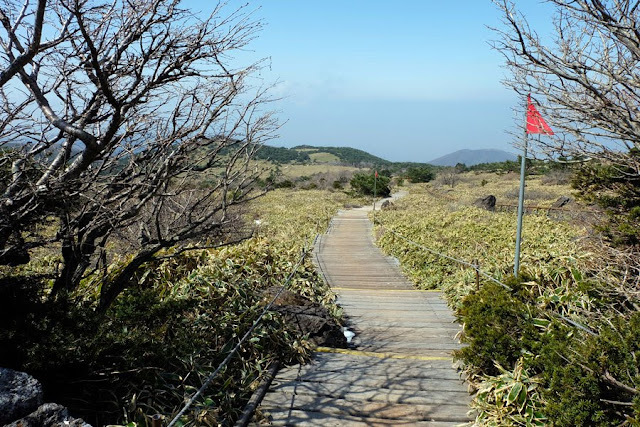 After about 1.5 kilometers of exercising on the StairMaster-with-a-view, the landscape turned into grassland with a boardwalk cutting through and pointing towards the peak of Hallasan. According to the trail map I had seen earlier, there was a potable water source somewhere. But the view made me forget to look for water. 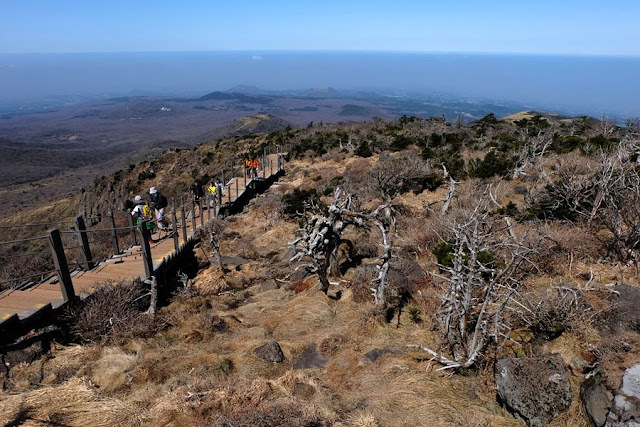 The boardwalk branched off to the left and I took the turn and climbed some steps to the viewdeck on Witsejogeun Oreum. But this was not the end of Yeongsil Trail. 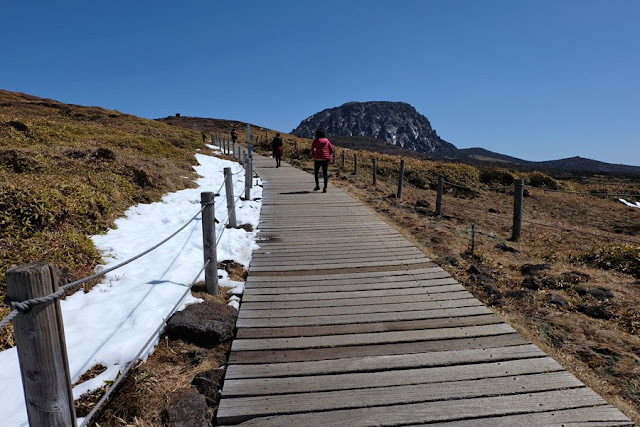 I went back to the boardwalk and continued following the boardwalk to Witseoreum Shelter, carefully walking through snow-covered portions of the path. 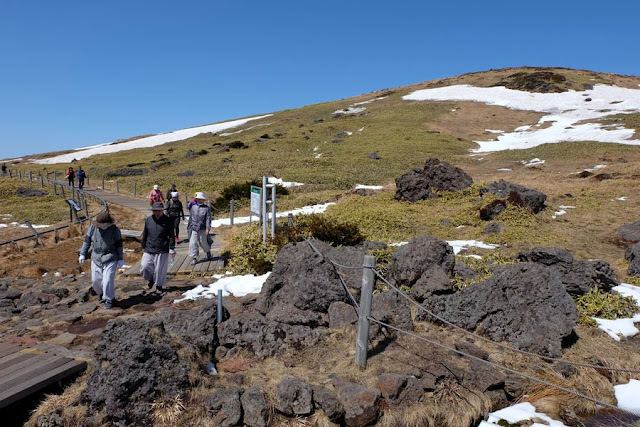 There were already many people at Witseoreum Shelter [1700masl], all of whom were sitting around, taking a break, and eating their packed lunches. I did the same. And ravens landed and slowly hopped towards me. I quickly moved away, afraid these black birds would steal my lunch. Back at Witseoreum Shelter, I tried to look for someone who had taken the Eorimok Trail to get here so I could ask for the trail conditions. I found one man who had hiked Eorimok that day, but he had very limited English vocabulary and could not say how Eorimok Trail was. 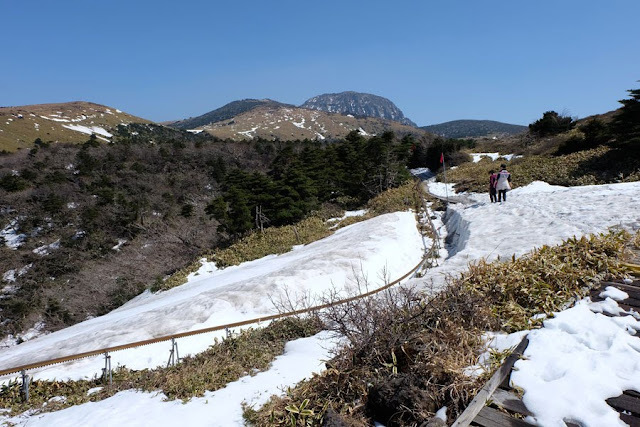 I weighed whether to descend the same way I had come—Yeongsil was a beautiful trail and I was now familiar of its condition—or take a chance and go down via Eorimok Trail—it would have a different view, but I had no idea what to expect, would it be a rougher trail (no wooden stairs)? Would it have more snow? I took the chance and took the Eorimok Trail. 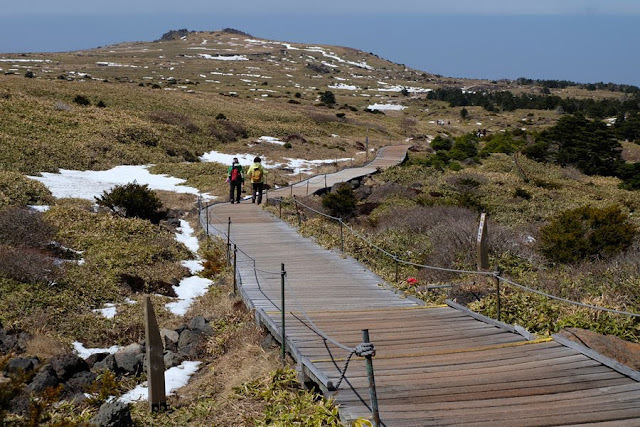 It started off easy: a gradual descent on a boardwalk, which went on for 1.5 kilometers, some areas still covered in snow. Then the 800-meter B Grade [Normal] section of stony descent. Somewhere in this section, I overtook the two ladies and I didn't see anyone else ahead of me. The two ladies took their time and soon fell back and I was left all alone...not a soul in sight ahead or behind me. The last section of my descent via Eorimok Trail was 2.4 kilometers of very uneven stony steps down through the woods. Portions of the path was covered in slippery snow. I had to step carefully while silently praying for safety. I did not want to slip and sprain my ankle as there was no one immediately ahead or behind me. I was ever so slow. One man eventually hurried past me and quickly disappeared down the path and behind the trees, and I was left alone again. As I reached a bridge, I knew I was almost home free! Almost—because from Eorimok trailhead (970masl) down to the bus stop, it was another 10-minute walk. 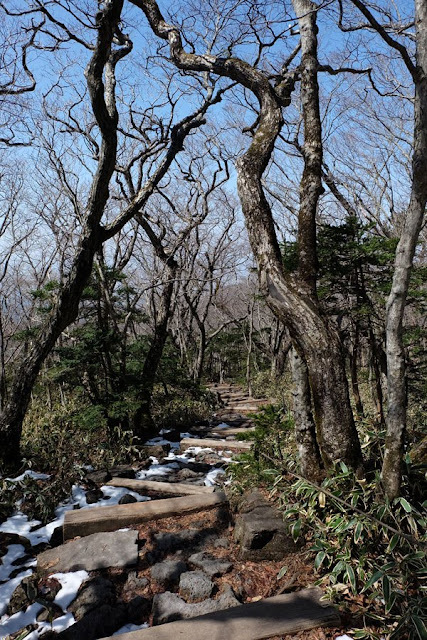 But an easy-peasy walk along a wood plank sidewalk compared to the rocky and slippery descent I had just been through. It took me five hours up and down Hallasan. I laughed and mentally patted myself on the back for pulling it off without any preparation nor thorough research. Mind, it was a fairly easy hike in that the trail was clear cut and not a technical one. 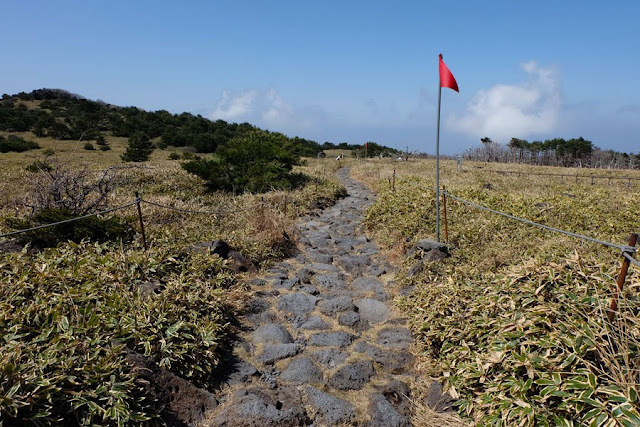 But, it could be hard on a person who hasn't hiked on a mountain for a long time and especially one who has no proper hiking shoes and clothes (I was in jeans, t-shirt, and sneakers). Important! 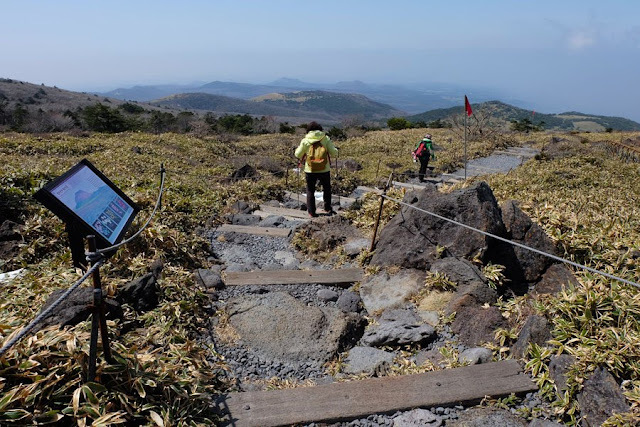 Cut-off times for hiking (ascending and descending) Hallasan is imposed. The time will depend on the season. Best to start hiking early! 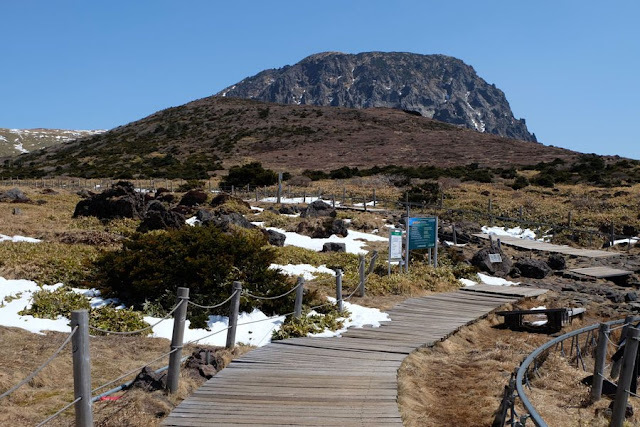 Directions by bus to Eorimok or Yeongsil: From Jeju Intercity Bus Terminal, take bus 240 to 어리목입구 Eorimok Entrance bus stop (40 minutes) or 영실매표소 Yeongsil Ticket Office bus stop (55 minutes). so which trail is the easier one? Hello Pinoy Royalty. 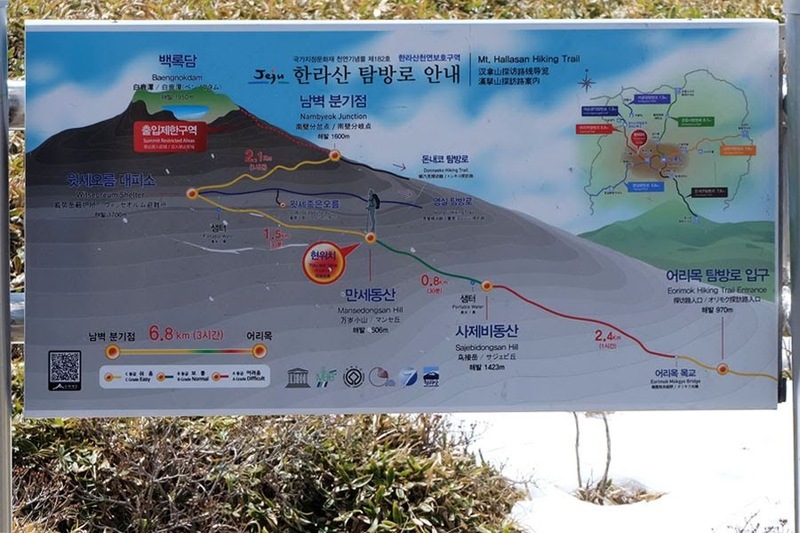 Yeongsil Trail is shorter, only 3.7 km up to Witseoreum Shelter; Eorimok Trail is 4.7 km up to the shelter. Please click on the trail maps posted above to check out each trail's grade/difficulty. 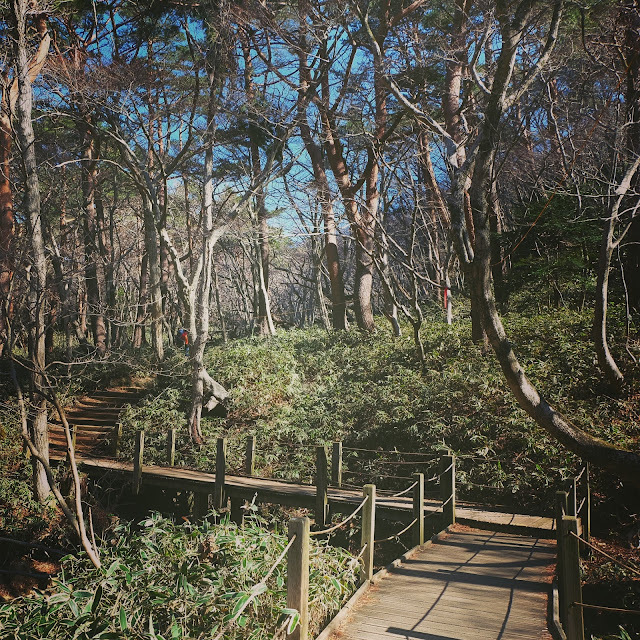 In my opinion, Yeongsil Trail is easier in that most of it was stairs and boardwalks. 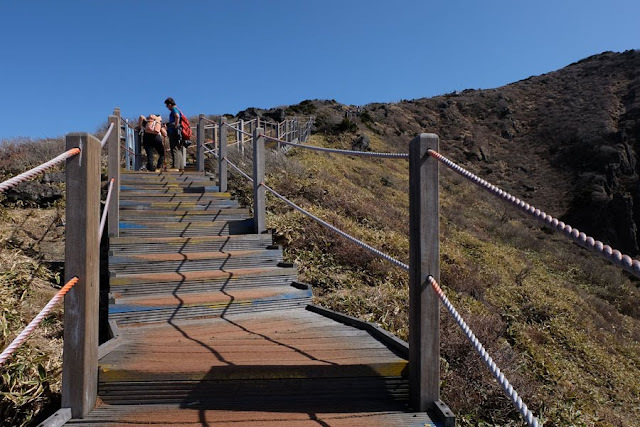 Half of Eorimok Trail was uneven stony steps.